This week I was working with a new colleague on our account team. As with all people knew to working with technical teams and bug tracking, she’s having to learn how to create good trouble tickets for when clients report issues. This is a challenge I’ve seen played out in every place I’ve ever worked: developers want detailed tickets so we can dive in without asking 16 follow up questions, and people creating tickets don’t actually know what we want and assume we know how to find and fix the problem. And so I’d like to try to offer this explanation of what we’re looking for and why. Where in the program is the problem? This is usually a link to a sample page that has the problem. What happened? I need a clear explanation of what went wrong. Is there a picture missing? Is the text format wrong? Is there a big red error message at the top? What you expected to happen? What is the picture of and where exactly was the picture supposed to appear? What formatting was supposed to appear on the text? Did you do something right before the error message appeared that helps me see that message again? These things are part of allowing me to reproduce the problem. If I can’t reproduce the problem, I can’t promise you I fixed it. If you can’t reproduce the problem, you can’t check that I’m right. Developers will often say that if you can’t give me the step to reproduce a problem I can’t fix it. But in my experience sometimes a problem is actually really hard to reproduce, and you need a developer or a professional tester to actually figure out those steps. So it’s okay if you can’t give me perfect directions, but give me what you have. If you find yourself writing a ticket that doesn’t say more than “Search is broken” or “Blog post didn’t look right” the problem better be massive (think big red error message level). As an account/support team member that may be all you got from the client but someone has to fill the gaps – and developers are terrible people to have fill those gaps. As a developer there are several reasons that’s true. First, rarely do developers get the luxury of working on one project for an extended period, and when they do those tools are large and complex. So we probably don’t have every detail in our heads at any moment. If we could store all that information we wouldn’t need task tracking systems, you could just call us and tell us about a problem as we’d call you back a few hours/days/weeks later and say “fixed”. Second, we’re terrible at finding mistakes in our own work. Like everyone else, we need editors. If I could see the problem you are reporting, I would probably have fixed it, or at least reported it to you so we could open a task to get it fixed later. Third, we probably don’t spend as much time in the project documentation as you do. So if someone needs to track down the original design to check for a discrepancy between the design and what’s happening a developer is probably going to be much slower at this task than you are (or you will become soon). Also remember your developer probably will not look at the problem today unless it’s mission critical to the client. So they need to be able to figure out three weeks from now what you were talking about. If it just says: “search is broken” and I run a search in two weeks and everything looks fine, you are going to need to tell me what’s broken about it (maybe a result is missing, maybe it’s formatted wrong, maybe it’s working perfectly but the client doesn’t like the results). Even with all that context, I know it is intimidating for many new support or account team members to crack the code developers use when talking. We over explain this, using technical terms, and get annoyed too quickly when people don’t understand us. And we often forget that teaching by analogy is helpful. If I came to you and said “my bread didn’t work out, please tell me how to fix it” how would you start? That helped her make the connection. Just saying my bread didn’t work out, doesn’t tell her enough to help me do it right next time. She’s going to have to ask several follow up questions before she can be helpful. Did it taste wrong or look wrong? What kind of bread was it? Did you follow the instructions or do something different? Did you knead it enough? Did you set the oven to the right temperature? I tried to make sourdough oatmeal bread over the weekend. I followed the recipe closely, but my bread turned out really dense instead of having the bready texture I expected. Now she knows there was a problem getting the bread to rise. So we can focus questions on the yeast and other details of getting air into bread. Yes, there are still several things that could have gone wrong, but now we know where to start. Frequently new support staff are intimidated by all the technical things they don’t know. And too often developers brush aside new staff who don’t give them the information they need and just say things like “Oh I’ll figure it myself” instead of helping their colleagues learn. Part of the solution is to help people understand that the first set of questions aren’t actually technical. Baking isn’t the right analogy for everyone, but it helped in this case. And hopefully next time I’ll do better at getting to a better explanation quickly. Also, my bread came out fine and I’m taking her a loaf this weekend. 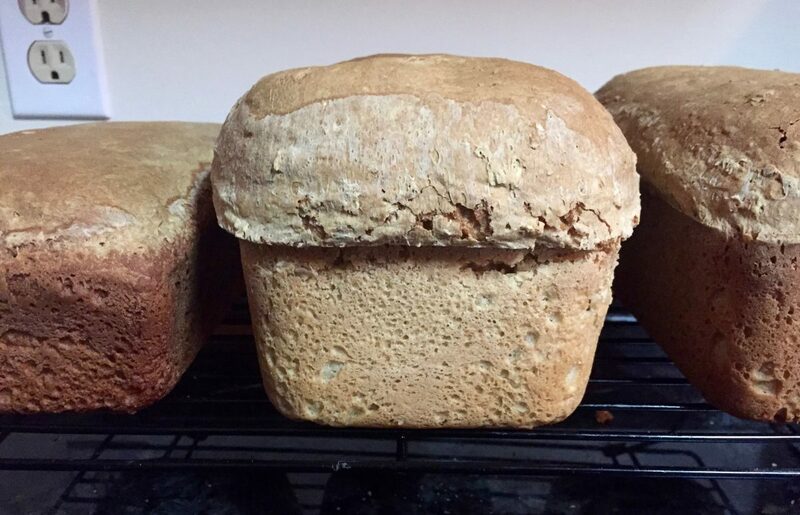 You are welcome to try my Sour dough oatmeal bread recipe. Next Next post: Are you moving forward or backward?